Chairman of the event, announced today. chairman. See Pages! and 3. 1 regular meeting on Jan.
commodate the Soviet Union's long range surface-to-air SAM-S missiles. Syrians be supplied with the weapons, Sharon said Israel could cope with them. has lived with long range missiles in the hands of the Syrians and Iraqis. the U.S. Sixth Fleet which often operates in eastern Mediterranean waters. Sharon Would not speculate as to why Moscow might supply them to Syria. aircraft, destroyed Soviet-built Syrian missiles. Wolff, Mr. and Mrs. Irving Kaufman. (Seated center) Louis w-Usher. Larry Ochstein. associate T^^^7h -^ ^^^^^ Penson. and Roslyn Gurwin. Alec Lngelstein. Irene Kornhauser and Shirley (Left lo right] Benjamin S. Hornslein, Mr. and Mrs. Myron J.
Leibow. Nickman and Michael Burrows. and Mrs. Myron Levy and Mr. and Mrs. Bernard Levy. and Mrs. Erwin Blonder and Mr. and Mrs. Lionel Mr. and Mrs. Nat Passon. [Left to right] Mr and Mrs. Harvey Goldberg, Mr. and Mrs.
Mr. and Mrs. George Marks. 'I Kates and Ira Feder. is Women's Division Campaign chairman. Mr. and Mrs. Robert Balgley. Mr. and Mrs. Mark Levy. 2200 N Federal hwy. Suite 208. Boca Raton. Fla 33432 Phone 368-2001.
t-omoined Jewish Appeal-Jewish Federation ot Palm Beach County, Inc.. Officers: President. County, he visited Pratt and Whitney as a guest of Morris A.
foundation as friends and allies. integration in one generation," stated Mr. Arens. "flexibility and concessions will not in themselves bring peace. army sacrificed its own personnel to save civilians." with the peace treaty with Egypt. the second year and ,s 1 ? an extremely useful tax tool. 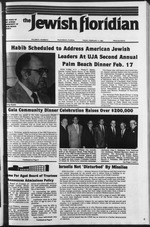 Program of the Jew ish Federation of Palm Beach County. dowment Director of the Jewish Federation at 832-2120. Under pre-act law, the "S"
rule and establishes new tests. during the three year period,! Ti?tinA' f.rom Mt lo rtiht, they are: Victor Duke, M**! Ws not easy to be a Riverside. standards for Jewish funeral service. Like to work with children? 'Nobody is safe from this,"
of the Jewish economic base. >^f OF THE PALM BEACHES, INC.
CM At 1*1 -(. * *. Rackmil, Harry Baumgarten, Harold Bloch, George Howard. Adam Elson, Murray Kern and William Musken. pe west of the Turnpike). r Olympic Pool. Private Tennis Courts. tion with Art Historian Dr.
meeting. Please plan to attend. guest speaker; and Norman Belfer, president-elect. Than taka II aasy Tafca Coal*. at Temple Beth Sholom 9:30 Chest. Feb. 24 at 12 Noon. to have a Tax Free Income." Belle Kreit or Ray Lesser. trs in the skilled trades. bang let go," Miller said. Europe for the final product. bring dropouts back to school. program at three high schools. Lampert, Leonard Karmelin and Seymour Fine. The JemisM FTondum. Stl Santh Ftofkr Dm. * est Palai Reach. FL 33*1.
percent of Shearson s Financial Consultants. her at "195 Pme Manor. Lake Worth. FL 33463." INVEST SOME OF YOU IN YOUR FUTURE'"
Former Dean of Students, Scarsdale, N.Y.
lould do to stem the tide. In to abandon the cult. event at the home of Diane and Richard Kaufman. to the women attending Bat Gurion Hadassah's Education Day. tiveness Training: Cults and You." partnerships, individuals, estates & trusts. are ottered weekly at the JCC. at any time. No fee. control your mind and body. aged to join this group. topics as suggested by group. or Libby to register, 689-7700. Center on Fridays at 11 p.m.
class. Fee $8 for eight lessons. the bus to Temple Emanu-El. serve a seat on the bus. to cover the cost of the vehicle. Maryland, New York C "
of Palm Beach County. Dr.
lecture series of Temple Judea. during his term of office. this a most successful affair. be a unique collectors corner. prev iew w ill begin at 6:30 p.m.
Marder and Cantor Earl J. Rackoff will officiate. Drive. Suite 305, W. Palm Beach, FL 33401. If desired,! 1470 Golden Lakes Blvd.. W. Palm Beach, Fl. 33411. Phone 689-9430. Rabb. 8 p.m.. Saturday and Holidays 8:45 a.m. Daily Minyan at 8:45 and 5 p.m.
Gardens. Office at 321 Northlake Blvd., North Palm Beach. Phone 845-1134. Friday at 8:15 p.m., Saturday at 9 a.m.
at Faith United Presbyterian Church, 275 Alemeida Drive, Palm Spring 33461. Temple B'nai Jacob. President Jacob Frant. Phone 964-0034. Sabbath services. Friday it 8 p.m., Saturday at 9 a.m. Mondays and Thursdays at 9 a.m.
33411. Cantor Nicholas Fenakel, President Ronnie Kramer (793-2700). H9Jwar1l0rihhaFnla*lerrPri,:e' Wcsl Pa,m *<* 33407. Phone 833-8421.
weiss. iabbath services, Friday 8 p.m.
^ndeis University Palm Beach Luncheon. |th Women Mitzvah Council 9:30 a.m.
igregation Anshe Sholom Sisterhood 10 a.m.
(nplc Emanu-EI Israel Bond Cocktail Party 4:30 p.m.
fmen's American ORT Palm Beach board 9:45 a.m.
Ication day B'nai B'rith Haifa board 2 p.m.
hgrcgation Anshei Sholom Sisterhood 1 p.m.
mh-Covered Bridge board -10 a.m. PREVIEW: 6:30 P.M. AUCTION: 7:30 P.M. THE CREATOR OF "COLOR IN MOTION"
'our Friends Are Cordially Invited! gogue of West Palm Beach. occasion of his 90th birthday. Okeechobee Blvd. in Boynton Beach. requires us to add two more as quickly as possible. be bondable. and have a good automobile. Experience not necessary as we'll train you thoroughly. General Manager, at 737-7411 or 272-0098. 6800 W Oakland Park BM.